A web-based service that allows a player to analyze results after recording them. Simply go to the website and input a session with all of the relevant information. Once enough information has been recorded, you'll be able to view hourly rate, total profit, and which game you're doing well at or struggling with. There is no reason to worry about software compatibility when using Poker Charts since there is no download necessary. 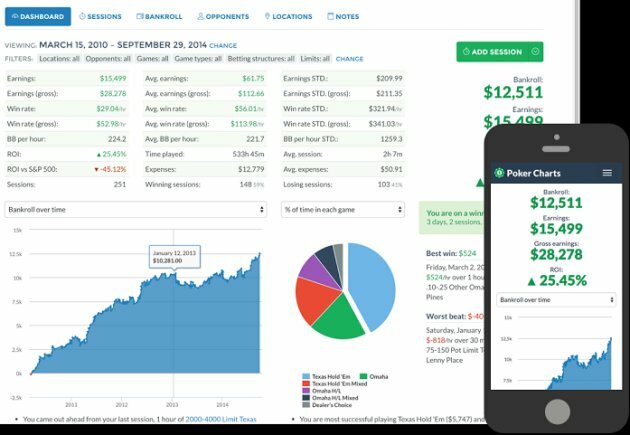 You can sign up for a free 30-day trial and then begin using Poker Charts immediately assuming you have one or more sessions ready to record. Poker Charts does not have the ability to import hands that are stored on programs such as PokerTracker or Hold'em Manager, which limits its use to players who are playing live poker or are in only one or two tables at a time when they play online. However, the software does allow you to save default settings to make entries for games you typically play the most often. Also, unlike PokerTracker or Hold'em Manager, the software allows you to make bankroll entries showing all your deposits and withdraws, providing a running snapshot of your bankroll. Live poker players will find Poker Charts useful when they categorize statistics by location, game type, blind structure, hourly rate, and more. Since the program is web-based, it is compatible with any smartphone or tablet, enabling timely entry of live sessions regardless of where you might be playing. Once the information has been recorded, Poker Charts users have the ability to graph and chart their rate of success on a dashboard, which also provides helpful bullet points about what types of games and locations they are most and least successful in. Players will need a relatively large sample size of sessions in order to get full value out of the graphs and charts.